APS Army Public Schools Teachers Recruitment Admit Cards, Exam dates 2018: Army Welfare Education Society invites applications for Teacher Selection Entrance Examination. 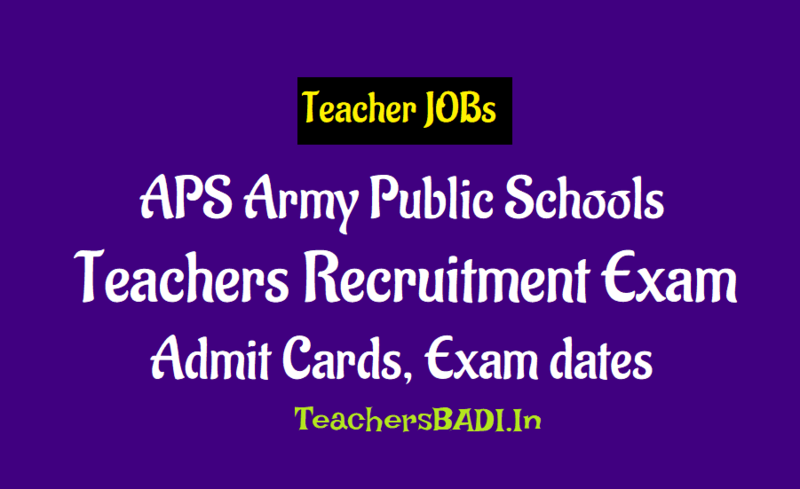 APS/Army Public Schools Teachers Recruitment 2018, APS PGT/TGT/PRT Teacher posts 2018 recruitment online exam date, admit cards,results and more details are given here. Army Public Schools(APS) has given teachers recruitment 2018 notification and APS invites applications for the recruitment of Teacher vacancies. There are 8000 Army Public Schools(APS) located in various Cantonments and Military Stations across India. These schools are administered and managed by local Army authorities and affiliated to CBSE through Army Welfare Education Society(AWES). AWES APS Teachers Recruitment Admit Cards: Army Welfare Education Society (AWES) has released official job notification for teacher recruitment at CBSE affiliated Army Public Schools. More than 8000 vacancies for PGT, TGT and PRT has been announced by AWES for 137 schools operating all over the country. Though exact date has not been announced yet, but the online combined selection screening examination is likely to be held on 17-18 November 2018. AWES will conduct the online test at 77 cities nationwide. Detailed recruitment notification is available on the website aps-csb.in. 'There are approximately 8000 teachers on the rolls of these schools. Approximately 8000 teachers get turned over every year due to various reasons in these schools.' AWES will select candidates on the basis of their performance in screening exam, interview and evaluation of teaching skills and computer proficiency. The score card will be valid for life provided the candidate takes up teaching position in any CBSE recognized school within 3 years of issue of Score Card. Interested candidates can submit their application till 24 October 2018. Candidates can get previous four years question papers from the official website of AWES by paying Rs. 100 each for Part A and B. Age limit for applicants with work experience (minimum 5 years teaching experience in the last 10 years) is below 57 years and for fresh candidates is below 40 years. 'CTET/TET conducted by state governments is mandatory for appointment as TGTs/PRTs. Others found fit in all other respects may be appointed on 'Adhoc' basis only till attainment of qualification. However CTET/TET is not mandatory for appearing in CSB online Screening exam,' reads the official notification regarding eligibility. Categories of Teachers: The exam will be held for the posts of PGT/ TGT/ PRT for all subjects. Age limit(As on 01 April 2018): Candidates should have below 40 years. Basic and Grade Pay are generally comparable to Central Govt rates and Allowances will be decided by respective school management. The same will be subject to financial viability of the school. Selection method: Based on Screening Exam, Interview, Evaluation of Teaching skills and computer proficiency. Registration: Candidates to register Online for the screening exam by logging onto the Registration Portal. Candidates are expected to register ON-LINE for the screening exam by logging onto the Registration Portal http://aps-csb.in/College/Index_New.aspx.